Help and Training Resources > Frequently Asked Questions > Can I use my phone or tablet to access the CRM? 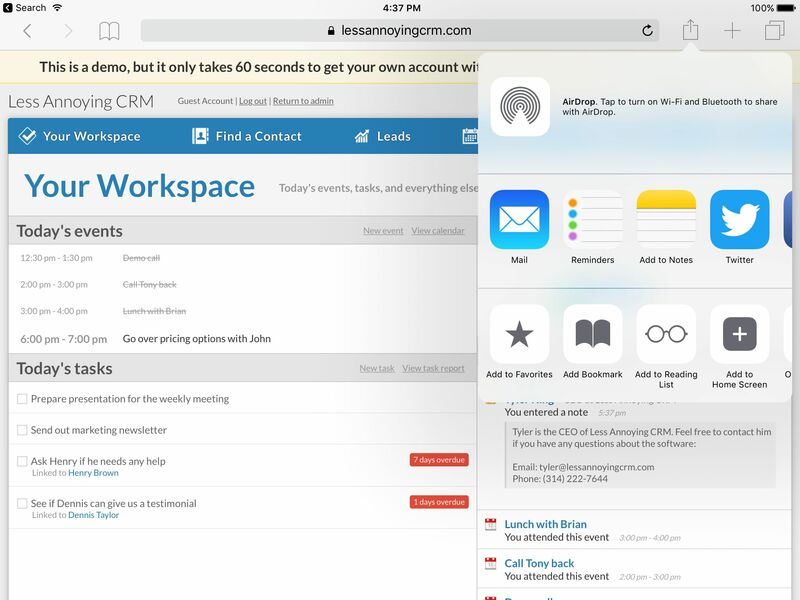 Less Annoying CRM is compatible with most mobile devices and tablets. Tablets will run the full version of the site with no problem—we designed Less Annoying CRM with tablet users in mind, so you shouldn’t be limited in any way by the touch interface. There are a few differences in how you'll find certain features (like groups and contact search), but all of the same functionality is available. As for phones, while you won’t find LACRM in the iTunes or Android app stores, we do offer a simple web app that you can access directly through your phone’s browser. Simply navigate to www.LessAnnoyingCRM.com/m to log in. Android devices: You can pin the mobile site to your homescreen on a mobile device, so that you can use it just like you would an app on your phone. You'll need to be using Chrome as your browser to do this. Simply bookmark the site (press the "star" icon in the menu once logged into the site), then open your bookmarks and press and hold the bookmark for Less Annoying CRM. The option to pin the mobile site will show up in the menu that appears. Windows Phones: You can access and log into the site from your Windows phone, and also pin the site to your main screen. Note that accessing the mobile site requires a connection of some kind—either you must have a connection to a data network (e. 3G/4G), or you must have access to a wireless network. 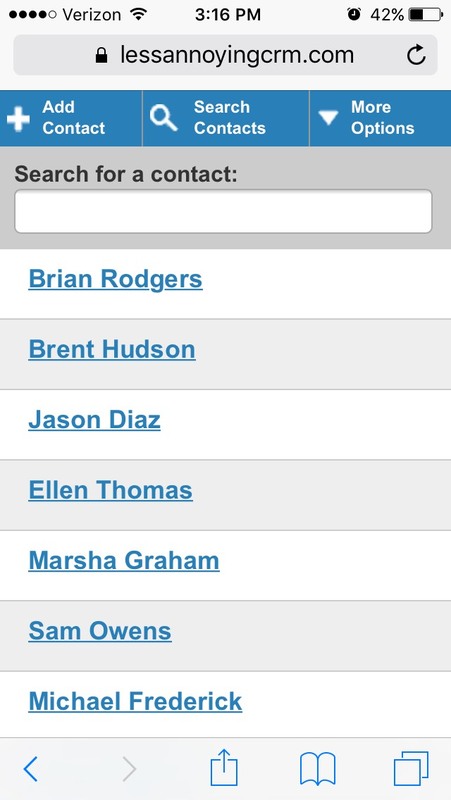 There is no offline mode for the Less Annoying CRM mobile web app. If you have any questions about the mobile site or how to get to your account from your phone or tablet, don't hesitate to contact us with questions.